WooCommerce vs Shopify: Which Is Better For E-Commerce? E-commerce is a big part of the world wide web. Pretty much anybody can now do business online and getting a store online is easier and cheaper than it has ever been. Online stores today look and work great. With the many choices we have for platforms, choosing which one to use can be a daunting task. There are a lot of things to consider when choosing an e-commerce platform: store management, inventory management, shopping cart systems, social networking, blogging, SEO, security, ease of use, expandability, and costs all play a big role in this decision. WooCommerce is a WordPress plugin that lets you turn your WordPress site into a full-featured online store. It gives you an easy way to handle inventory, payments, shipping, and more. It gives you reports on customers and products and it works with practically any theme and doesn’t get in the way of your website. It can be easily integrated into an existing site as well. There are many themes available for WordPress that are compatible with e-commerce plugins such as WooCommerce. Here is a quick look at just a few, starting with a free one from WooThemes designed specifically for WooCommerce. StoreFront is a free responsive WordPress theme from WooThemes that integrates with WooCommerce to build a sharp online store.There are no built-in sliders, shortcodes, or page builders, allowing you to choose your own through plugins. It has multiple widget areas, a flexible CSS grid, and can be expanded through the StoreFront Designer extension. It is built on Automattic’s Underscore’s theme. 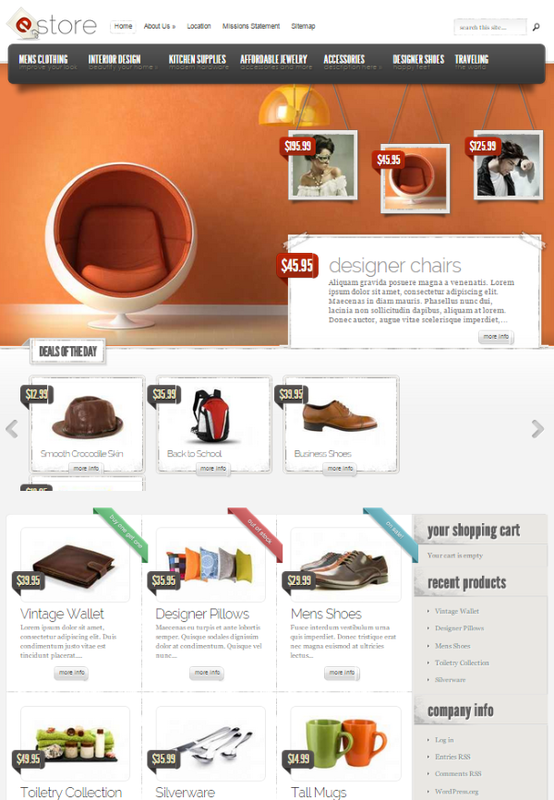 StyleShop is one of our own themes that was developed specifically for e-commerce, including WooCommerce. It is responsive and includes theme options to manage the layout, advertisements, colors, and so forth. It has page templates for galleries, contact pages, site maps, blog feeds, and more. It has shortcodes so you can create complex layouts without having to program them. It integrates fully with the WooCommerce plugin. StyleShop is available in the Personal plan for $69 per year. eStore was developed specifically for e-commerce sites. It comes with several free e-commerce plugins that include eShop and PayPal. 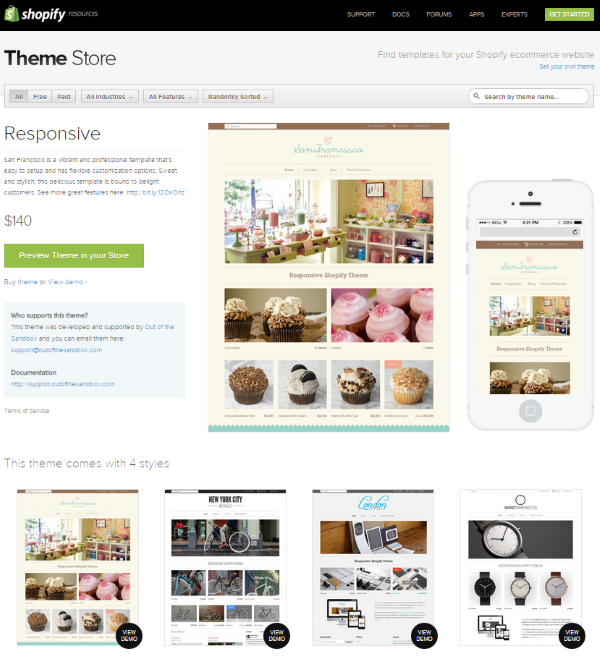 WooCommerce is highly recommended for use with this theme. You can display deals of the day, choose how many to display and the category, and can even include WooCommerce products as a category. It has five different color choices, theme options, shortcodes, and page templates. eStore is also available in the Personal plan for $69 per year. Divi was designed to be compatible with the latest WooCommerce plugin. It includes a module called eCommerce that integrates fully with WooCommerce. You can use the WooCommerce plugin with or without the builder and you can create pages for the shopping cart, checkout, and more. You can use WooCommerce categories and WooCommerce shortcodes within a text module. The eCommerce module’s settings let you choose to display by type, how many to display, how many columns to display, and has an order by function (popularity, rating, date, price low to high, price high to low). Divi is available in the Personal plan for $69 per year. 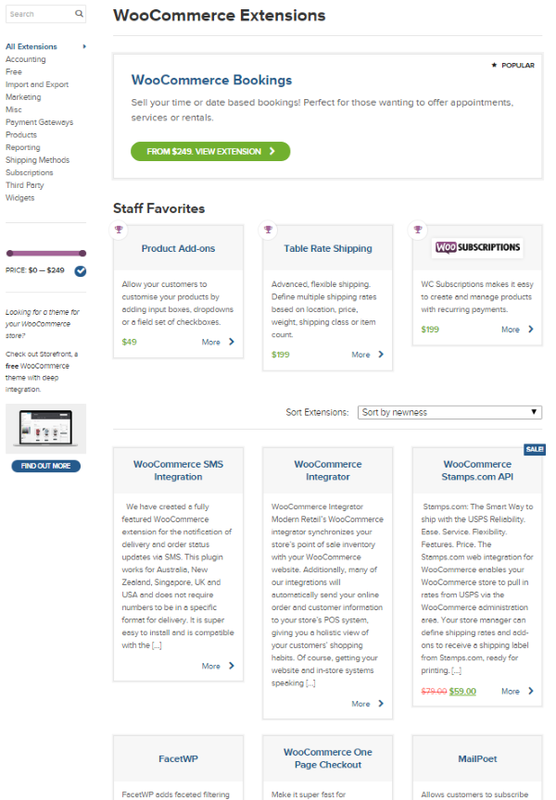 There are 320 extensions available to expand the functionality of WooCommerce such as product search, recommendations, 360 degree image, future pay, antifraud, coupon campaigns, affiliate software, and more. Prices range from free to $249. Getting started with WooCommerce is as simple as uploading the plugin to your WordPress site, adjusting any settings you want to change (for example, set it to US dollars), and then start uploading your items to fill your inventory. Uploading products is exactly like creating a post and adding pictures. You can then set the product description, enter prices, set stock status, choose a product category, link or group to other products, set product attributes, and enable or disable reviews. You can add gallery images and set the featured image. You use your regular WordPress SEO for each product, so you would set it just like you would any post. For shipping info you can set the weight and dimensions of each product. You can handle orders through the dashboard. It shows you the customer’s info along with the products they’ve bought. You can set the order as Processing or Complete and you can view the order’s details. You can also add orders manually if you want. Now, you can choose to allow WooCommerce to handle your inventory levels or you can turn it off and handle it manually if you prefer. Inventory management is handled in each product’s settings. You can set the inventory level, choose to allow back orders, show stock status, choose if only one can be purchased per order, and set if the product is virtual or physical. There’s also the ability to set shipping options, such as free shipping and flat rate, and you can add more shipping methods and features through extensions (some of the extensions cost extra and costs vary depending on the features you want). The Reports will show your orders by date (with selectable ranges), by product, by category, and it will show coupons. It gives you easy to use graphs and the data can be exported as CSV files. You can also view your customer’s info and your inventory levels. Since your store is built into your WordPress site, you can manage your store from anywhere you want, including your smartphone. This is great for managing your store and interacting with your customers while on the go. The WooCommerce plugin is free. WooCommerce does not offer a complete online storefront, so you’ll have to find your own URL, hosting, theme, etc. You will also have to provide your own security and maintenance. It will integrate with many free themes and with themes from Elegant Themes, keeping the price low. For transactions, there are a lot of choices of payment gateways that include services such as PayPal, Amazon, and Stripe. PayPal is $79 for a single site, takes major credit cards, provides security, and provides nice shopping cart features. Amazon is free and connects to your Amazon seller account. Each provider has their own transaction fees. For example, Stripe has no monthly fee and charges 2.9% + $0.30 per transaction. WooCommerce lets you have complete ownership of your site. It integrates seamlessly into many WordPress themes and can easily be added to your current site. The plugin is free and provides powerful tools to manage your inventory, turning your site into a complete online store. Shopify is an e-commerce platform where you can create your own online storefront and customize it without having to know anything about web development. It has over 100 store templates, or you can build your own if you wish. 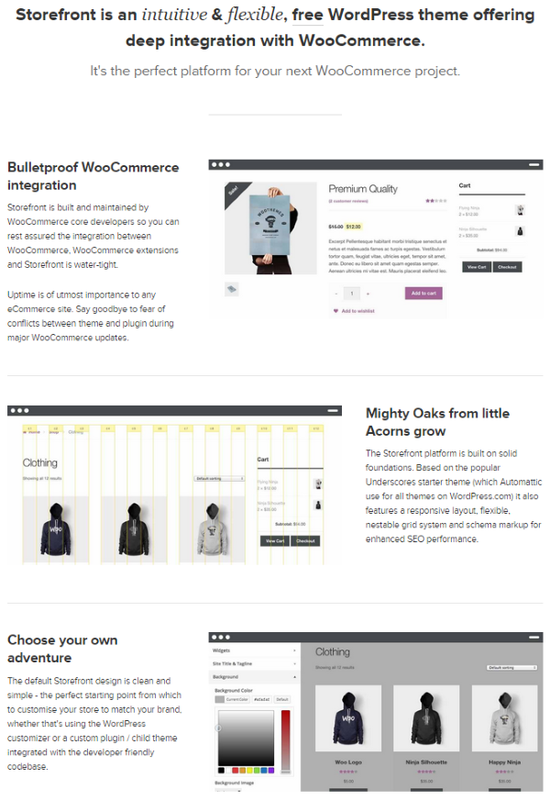 Shopify is a complete WYSIWYG CMS. You have control over your navigation, pages, and design. It has a blogging platform where you can interact with your customers through comments, too. 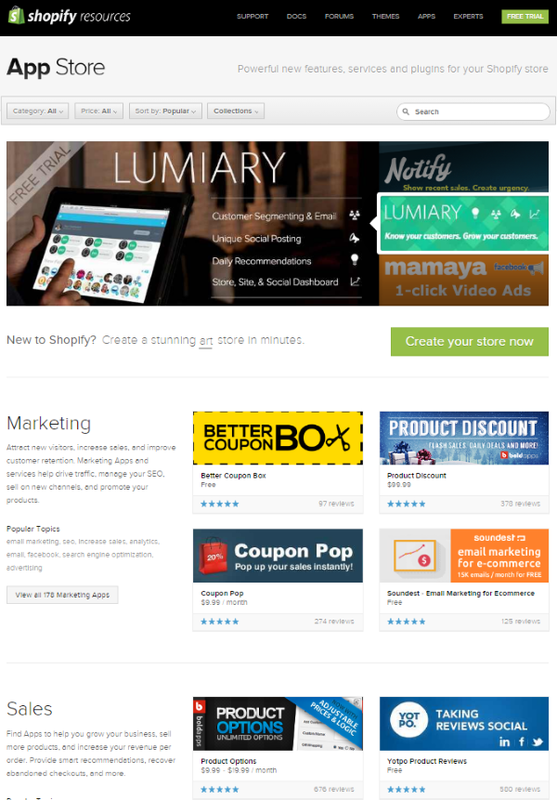 There are both free and paid themes for Shopify. Prices for the paid themes range from $80 to $180. Most themes are over $100 and the most popular themes are $140. Just like WordPress, you can also get themes from third party developers. Let’s take a quick look at a few of the most popular themes. 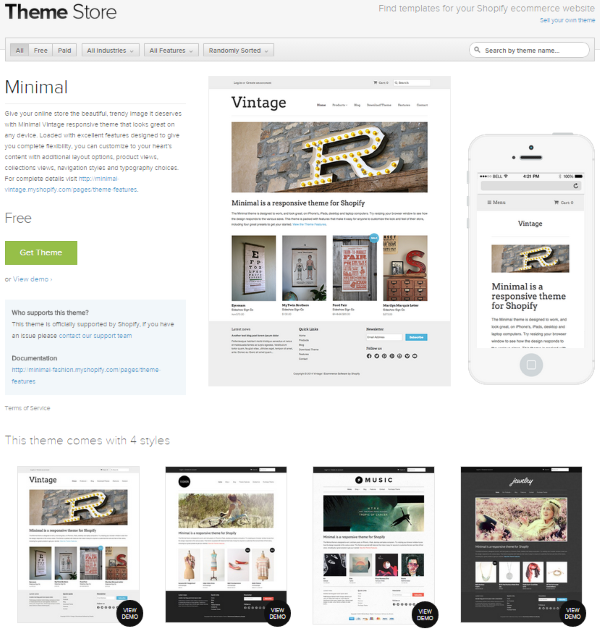 Vintage is the current most popular free theme (and most popular overall). It’s responsive, has different layout options, product views, collections views, navigation styles, and typography choices. You can set the home page, footer, header, etc., and adjust the colors and fonts for each. It’s available in four different styles. The current most popular paid theme is San Francisco. 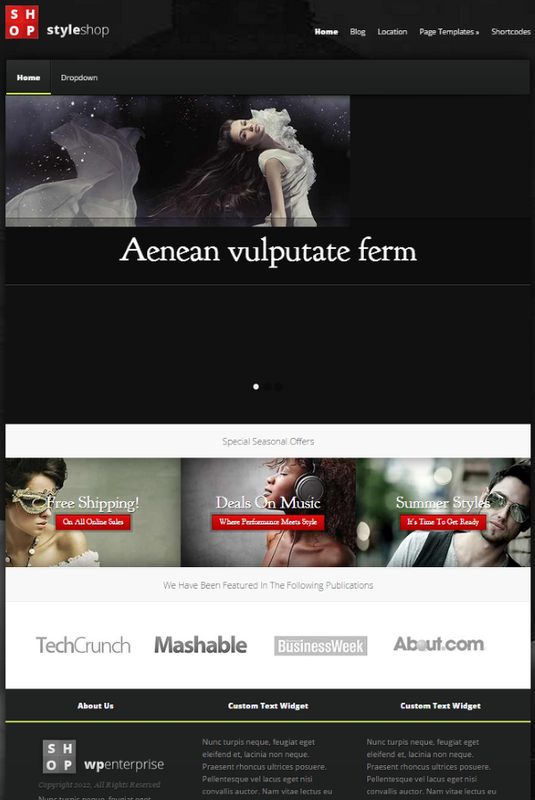 It is one of the four styles of a theme called Responsive (and it is responsive). You can adjust all background colors, fonts, styles, etc. It includes a slideshow, gallery, currency convertor, shipping rates calculator, Back in Stock notification request form, featured collections, customizable sidebar, social media sharing, and more. It also includes support for MailChimp, Disqus, Gravitar, and more. It costs $140. This one from ThemeForest is one of the most impressive themes for Shopify. This responsive theme was written in HTML5 and CSS3, and has over 100 settings. It’s e-commerce ready, has a dual product slider, newsletter subscription form, dynamic collection drop down menu that’s touch friendly, a Twitter feed, and a layered PSD file. This is a premium theme with several buying options. It costs $53 for use by a single client and a single end product which users are not charged for. It costs $2650 for use by a single client and a single end product which users are charged for. There are 912 apps in the app store. They add features and services to your store such as social login, email builder, store locator, order printer, sale rack, and much more. They range from free to $450 per month (or higher for enterprise apps). There are a lot of free apps. Most paid apps are between $10 and $50 per month. The apps are reviewed, so you can make good decisions about what you choose. Getting your store started is as simple as choosing your plan, choosing a template, and uploading your items. This is a fast and easy way to get a store up and running. You can then start blogging, start building your email list, or start modifying your store’s look. You can handle order fulfilment, refunds, drop-shipping, and more from the back end. For order fulfillment, you can connect your site to Amazon, Webgistix, Shipwire, or set up a custom fulfilment system. For drop-shipping you can connect to Ordoro, Inventory Source, and eCommHub. Your inventory is managed completely in the back end of Shopify. It will track your inventory levels and automatically show that something is out of stock so that you don’t keep selling something you don’t have in stock. You can offer product variations such as sizes, colors, materials, etc. You can also set the price, weight, SKU, and inventory amounts for each variation independently. Plus, it’s easy to organize your inventory by category, type, sale, season, and so forth then sort by vendor, price, and inventory level. Each item can have multiple images. You can also offer digital products through downloads. Your inventory files can be imported and exported with CVS files or with a Shopify app. Your dashboard also shows you your site’s analytics. You can use the built in reports to understand what your customers liked or didn’t like. You can track your product sales, orders, and payments. This shows you what sells and what doesn’t. You can see the reports on a monthly comparison and export it to share with others. You can choose the type of information you want, so you don’t have to see everything in a report unless you want to. This lets you share only the information you deem important. The reports can also be filtered to make them easier to read. It also gives you the option to connect to Google Analytics so you can analyze your traffic. You can see profiles about each customer, including all contact info and order history. This way you can learn their shopping habits. Group customers by location, purchase history, cart abandonment, and so on. You can even manage your store from your phone while on the go if you want. You get a mobile dashboard where you can track your sales and inventory, handle orders, and interact with customers. You also get a free card reader so you can take credit cards in person using your smartphone. 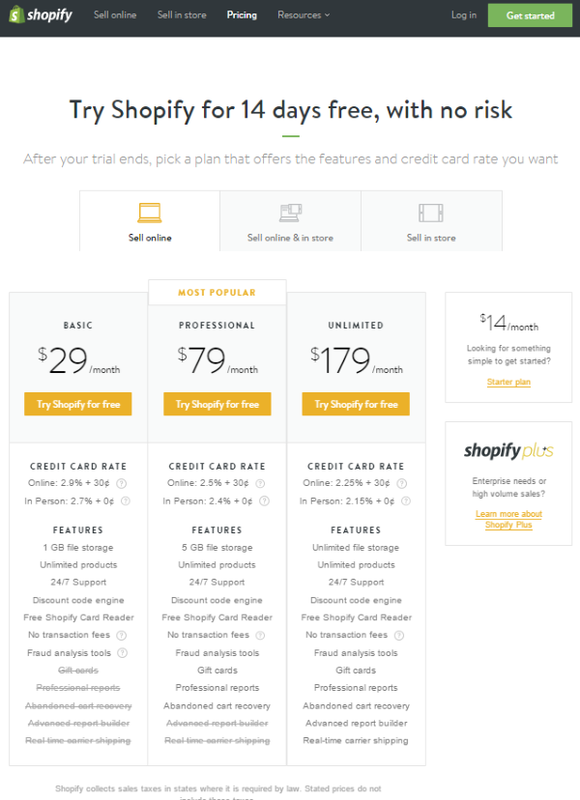 Shopify is a premium service with several plans to choose from. The Starter plan is $14 per month. It includes 2.9% + $0.30 credit card rate, 25 products, 1 GB storage, unlimited bandwidth, and chat and email support. You can use Shopify payments without a transaction fee. The Basic plan can also be used for Point of Sale, so you can use it for a brick-and-mortar store as well as online. It costs $29 per month and adds POS rate is 2.7% + no credit card fee, unlimited products, 24/7 support, discount codes, a free card reader, and fraud analysis tools. The Professional plan is $79 per month and brings the online rate down to 2.5% + $0.30 and the in person rate to 2.4%. It has 5 GB of storage and adds gift cards, professional reports, and abandoned cart recovery. The Unlimited plan is $179 per month and takes the credit card rate to 2.25% and the in person rate to 2.15%. It has unlimited storage and adds an advanced report builder and real time carrier shipping. If you really want to kick it up and go Enterprise, you can get Shopify Plus. This is for high volume business and it adds a lot of services. It has a 0% transaction fee, dedicated priority support, dedicated SSL, multipass/SSO API, early access to new features, special prices on select apps, and much more. You must contact them for pricing. For getting a store online fast and easy, Shopify delivers. It’s easy to use and you don’t have to worry about maintenance. You don’t own the site and the cost of hosting and apps can get expensive over time. Although you can do a lot with Shopify you’re more limited than you are with WooCommerce. Which would be better for you depends on what you want from your site. Do you want a store only? Do you want to have a powerful blogging platform? Do you want to own your site and have more control? Do you want to not have to worry about site maintenance? If you want an online store that’s easy to deal with and you’re willing to pay whatever it costs, Shopify is a good choice. It’s simple, looks great, has excellent e-commerce features, and hosting and maintenance are taken care of. Support is easy to get if you need it and you can expand your store’s features and functions with tons of add-ons. The blogging platform has basic functions. You can blog there, but it’s weak at best. It can’t be expanded like a WordPress site can and if you decide you want to move it, you will have to copy and paste or use a plugin that requires lots of work setting up every post. It’s a good choice for just a store, but it’s not a good choice for a website or a blog that includes a store. It can be pricey, but the cost is clear and up front. If you want to choose your own host, have more control over your site, own the site—and you don’t mind the extra work of running a WordPress site—WooCommerce is the clear choice. A WordPress site powered by WooCommerce will be cheaper and give you more control. The WooCommerce plugin is free and you can choose from literally thousands of themes, both free and premium, that integrate nicely with WooCommerce. It can be added seamlessly to your current WordPress site. Support for your site is not always that easy because it’s an integration of several systems. If you already have a site, no new site is required. If you want blogging to be a big part of your site, then WordPress again is the clear winner. Even though the plugin is free, extensions can cost money and you still have the expense of running a WordPress site, and the total cost is not so clear. Shopify and WooCommerce are both great choices that serve different purposes and audiences. Shopify is easy to use and maintenance is taken care of, but it is more limited and gets expensive. WooCommerce is free and flexible, and integrates easily into your WordPress site, which you are completely responsible for. The best choice will depend on the needs of your business. How about you? Have you tried Shopify or WooCommerce? What has your experience been like? I’d like to hear about it in the comments below! I switched over to WordPress from Joomla about a month ago (Straight to ET). I’ve been using ECWID for a shopping Cart and moving it to my Divi site took less than 5 minutes. Although Divi is set up for Woo, I’m going to stick with ECWID. A ECWID plugin and shortcode makes it work on virtually and site page and post. I use WooCommerce, Shopify and Ecwid with my clients. All three are great platforms – it just depends on the client’s needs. Ecwid also offers the ability to place the store on Facebook, which appeals to many of my clients. Agreed. I’ve been using ecwid for the past two years. I have one store but four brands, and I can show each specific brand on each individual WordPress site. It makes things so easy on the back end of things. The best thing about ecwid is the ability to copy a product, so similar items can be duplicated instead of starting from scratch each time. Love it! Thank you all for your input! So nice to hear from those actively using these tools! Great post! In my opinion, the best plugin that I have ever tested for ecommerce is woocommerce but don´t discount using shopify to others proyects, looks great! The level of updates it gets is remarkable and is comforting. For a free product it is remarkable. The premium plugins however are very expensive. How can be premium plugin very expensive for e-commerce? E-commerce brings money, if you will invest smart, it will brings you back much more. This was exactly what I was looking to read! Thank you! The screenshot of storefront pro theme is wrong. Please change it. 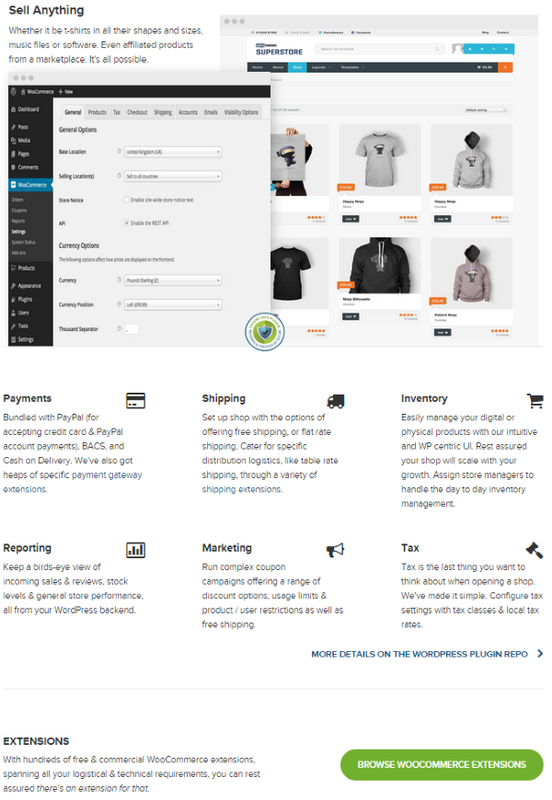 you have placed the screenshot of “storefront” wooCommerce over there. Its a wordpress blog and theme website so no body is going to really like Shopify 🙂 I love both woocommerce as well as shopify.. both systems are great. It depends on your requirements, if you want turnkey solution go with Shopify othwerwise woocommerce is best to ‘start’ your store and you can move to more advance systems like magento, prestashop later.. Thanks for this very timely article as I am right in the middle of getting a shop set up and actually was doing my own comparison of the two! I am sticking with my original decision to use Divi with WooCommerce. After trying out most all of the available plug-ins and services, I decided that I was tired of doing the same work over and over again. Square allows you to create your items and variations and use them in your app, on their e-commerce pages, and embed them in your own site. No upfront charge, just the %age every time a purchase is made. Photographers do better with none of these choices. We have A LOT of products. As a long time WP user/designer, having used several various ecommerce solutions since 2004, I finally found an easy to upload (straight from Lightroom), easy to price, offer discounts, easy for customers to buy, affordable (starting at $10/month for 1500 photos), great mobile responsive interface, sharing on social media. fast seemingly 24/7 response time re questions: ShootProof. I was turned onto it via a large, private Facebook photography group a year ago. I’ve explored many other photo platforms which integrate better w/WordPress, which I think both PhotoShelter and SmugMug offer. Plus there’s Zenfolio. These are THE most popular ecommerce solutions for photographers. For low cost and ease of use, ShootProof is tops. Who cares it doesn’t look like my site? I use my WP blog/site and Facebook to market my early, classic punk photos. People LOVE it!!! So do I.
I used DIVI to create the MOST wonderful landing page promoting my current photo sale. DIVI is a game changer!! I barely customized CSS, mostly outta the box. IT really worked! Sent ppl to either my store for prints or PayPal for special products not on my store. Marketing via FB, pals posting about it, helped too. But NO ONE cared that my store doesn’t look like my Divi page or my site, using a Pinterest inspired theme. They don’t care. As long as they can SEE what they want and EASILY pay. Not to say I don’t care about design. I DO! But sometimes, it’s better to focus on what works. In this case, three radically different designs. Using the same logo and photos. PS I used free ecwid prior to ShootProof. I’ve always wanted software to upload ONE price list, not having to add prices and sizes to every single photo. That drove me nuts using ecwid. Plus it refused to calculate shipping correctly for international sales. I found the interface cumbersome. Tech support via forums were hopelessly outdated or needlessly confusing. I would never pay for it, cos the free didn’t impress me at all. To each their own! Sometimes simple and direct works. My plain vanilla ecommerce store is the EASIEST for me to create and modify and easiest for customers throughout the world. That way I can focus blogging, marketing, and posting more photos, stories and products. Finally!! It’s been a LONG journey. Jenny, thanks for sharing ShootProof. I’ve been a long time ET user and just built out an entire photo sales store using WooCommerce with Divi for my son. It was a TON of work including custom lightroom plugins and an add-on to batch upload the images to sell as digital downloads. I just figured out how to add-on variable tangible products like mugs and mouse pads, WooCommerce handles this beautifully, but it sounds like ShootProof might make that management easier. Even though we have our site done, I’m going to check it out. I like the idea of integrating with lab fulfillment – something I’ve been investigating for my son’s site anyway. Forgot to mention: ShootProof takes NO percentage. Typical banking fee, like PayPal. Deposits directly to your bank account. Just pay the monthly. Whatta concept!!! OpenCart is an e-commerance site from the start, no plugins needed. Open Source, like WordPress…. For large sites, the best to use. OC is fine, but imho lacks some important stuff – you can integrate blogs, but comperig to WP it’s a joke, but the main issues is SEO. Of course you can install a plugin, but the decent ones cost a bunch and not as easy to manage comparing to WP. You are right about the big shops, but in this case I’d rather go magento. Great and bit long article Brenda and took some time to go through it. Both are very good but based on my experience with WooCommerce I like it very much. Thanks for sharing nice article. I have been using WordPress for a few years now on various projects. WordPress is great for many things, but…Unless you’re a developer don’t go with WordPress for e-commerce – I did and have had huge problems with certain themes being soooo sloooow (used in conjunction with WooCommerce). Theme previews and developer sample sites are great – all funky, fast and draw you in, but a client had to eventually move to their own server at considerable cost due to speed issues (even after using caching plug-ins). Multi structured menu building was a nightmare due to inherent limits WordPress applies by default (eg.. a menu just vanishes after adding a certain amount of menu items). Plug-in conflicts. A lot of themes (yes the paid-for ones!) require extensive CSS knowledge to get the best out of them. Some even require PHP skills to modify them! I’ve had had hacker problems via a Newsletter plug-in which led to the site host freezing the account. Free (or reasonably cheap) and flexible is great, but unless you have the experience and trouble shooting skills…! I’d say go with something that has a solid foundation, with a cohesive and structured all-inclusive development path, under one roof. At least you only have to deal with one company if you have issues and it may save your sanity! WooCommerce, always! I personally would never recommenced Shopify to my clients. We keep things owned by our clients when we build and develop for them. It’s sketchy not to, in my opinion. At the end of the day, you should own your site, your domain name, etc. Same here – and paying 140$ for a decent theme is a bit of a stretch. especially for clients who know nothing about hosting, systems it looks shopify its better choice. These clients really don’t need own hosting and other staff, bc. they are not able to manage it. How about PCI compliance? 🙂 Also, some ‘experts’ have been saying that WooCommerce isn’t suitable for large stores. Perhaps you could address that in this post, or a near future one. Very informative post. I prefer woocommerce between both of them. Thanks for the awesome share. I prefer WooCommerce because of the WordPress platform. Often websites need more than just e-commerce, they might need a directory or something else. Just to let you know, WooCommerce has come out with a plugin that ALSO let’s you have your store on Facebook! So don’t let that deter you. I’m also in favor of owning/controlling everything yourself. Many of my customers are startups with low budgets and they love the fact that they don’t have to pay monthly for owning a store, except for a low web hosting fee. What I don’t like about ECWID, and I’m sure this can be fixed with CSS or maybe in the PHP code, is the layout of the single product page, where all the info is below the image instead of something to the right of it like with WooCommerce. Looks friendlier. They do have that gray bar on the right side but it’s not as nice to me, but maybe it’s better and if you style it, it could be okay. With other words, I’d have to spend a long time fixing it to where I like the looks and layout. Also WooCommerce creates all the shopping cart pages for you, maybe ECWID does this also but I didn’t see that. I did see where you have to copy and paste a bunch of code into webpages. Didn’t look like short code either. Not that important of course, because functionalities are more important. Thanks so much I am at the point where I need to set up my storefront, this info tells me that I am looking for Shopify, as opposed to WooCommerce. You have saved me a lot of time. Thank you! I love this comparison. It is always refreshing to see a company with obvious bias (in this case, WordPress) take a level-headed approach. While we also create themes, there are definite cases where WordPress is simply NOT the answer and it is more advantageous for us and for the client to build on Shopify. They are going to pay more out of pocket, but it is totally worth it. Great post!! i prefer shopify because there is no coding skills requirement. these days boosting online traffic become a challenge for ecommerce site there are numerous system which serves to the ecommerce site for expanding their sales. like affiliate marketing, online advertising, refferal marketing and so forth. I needed to present a referral viral promoting tool which helps in increasing, obtaining new users and holding existing users. We run referral crusades for online sites and needed to band together with your organization. I prefer to choose WooCommerce! No doubt wooCommerce is most powerful one.I prefer to use this plugin to develop eCommerce website. I currently have a Shopify store and a WordPress blog. I’ve had my Shopify store for nearly 4 years. I sell textures and digital designs – I started out on Zenfolio and there’s a lot to love about Zenfolio – including ease of uploading images from Lighroom, but it’s also very limited in some areas as it’s really meant to be for photographers selling to their clients. Then, I sold on my WordPress site using e-junkie. This was just before WooCommerce came out. I was hacked – twice. Really put me off WP for e-commerce. If I do it again, I will only do it if I have managed hosting. So, I set up a Shopify store. I have to say that I love my Shopify store. It looks beautiful, it’s easy to use. It’s secure. BUT it does have it’s limitations. The blog is woefully inadequate. also, many really great plug-ins for WordPress like galleries aren’t available for Shopify. So, I have to maintain both a Shopify store and a WordPress site. I don’t like having my sites divided. I want the galleries etc. to be on one site. Also, if you do it RIGHT – getting managed hosting, premium plug-ins, etc. for WP, plus the high fees of Shopify and the added costs of apps. It get expensive! I’m really torn right now about maybe moving my store onto WooCommerce. There are so many options available for WooCommerce / WordPress like Membership sites, courses, etc. It’s going to require an investment in money for the WooCommerce add-ons, the learning curve, and I worry about all the sites that advise against WooCommerce for a lot of products. 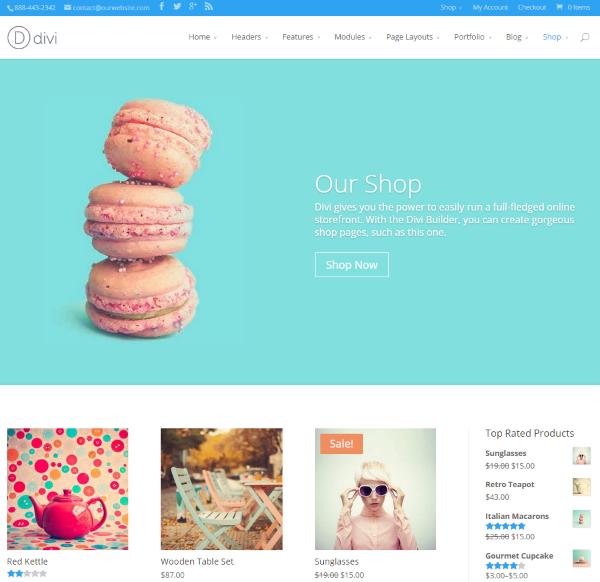 I just bought Divi – so I’m really playing with the idea! It’s too bad Shopify has such a wimpy blog feature or to be honest, I’d stick with them since I’m already set up there. If I was starting up now, it would be a hard choice. I have been playing with WooCommerce for a little while and the big surprise is that the costs very quickly exceed the Shopify monthly fee for a store my size (75 products). Credit card processing for most outfits? $79/year. Simple USPS rate calculation? $79/year. Ability to import a CSV of your product list? $199/year. It adds up quick. I get all this for less than $120/year with my current Joomla-Mijoshop set up, and Shopify is also cheaper in the long run. Very detailed and interesting comparison, thank you! Having a WP site already, I’d most probably choose WooCommerce plugin, but that’s not the case for me. I have no other website and no time to spend for store’s troubleshooting, so I prefer Shopify more. That’s a wonderful and very simple platform that I really enjoy using! By the way, I’d recommend to choose the Professional plan for $79 a month – a happy medium between cheaper and more expensive ones. Actually, I’ve started with Jigoshop initially (mostly cuz it’s free, not cuz it’s good), but since it was buggy throughout, I’ve switched to Shopify eventually. It costed me something like $70 for migration using Cart2cart service, but everything went pretty good. Overall, I think Shopify absolutely worths it, though sometimes I get a bit stingy when thinking about 2.5% shopify fee on transactions (depends on a plan you use). Hey Brenda, really nice and detailed comparison you have posted and I must agree with you that WooCommerce provides us with much control over the site and I guess that is one thing that WooCommerce users like the most about. We prefer developing eCommerce products for our clients on WooCommerce because it’s quite easy to work on. The best aspect of WooCommerce is that it can be easily integrated with any plugins and themes thus there is never any lack of categories and options. Features like coupons,free shipping and discount options can help boost of your sales rapidly. With sales reports, reviews you can check your store’s overall performance. I am SO confused. I will have less than 10 skus but need lots of features to sell a packaged food product. I have read ad-nauseum about which site to go with and hosted vs. not but am still perplexed! First, I was going Woo for flexibility and control and lower costs. Then, a few knowledgable, small-medium sized agencies suggested it was a big mistake to go Woo b/c it’s simply to easy for a hacker to get in and if I get hacked once, could put me out of business (obviously a great risk!). Plus, adding up the costs of Woo, seemed like it wasn’t actually going to save me money and including the cost of development, might actually be more expensive than a hosted solution. Note they gave this advice knowing they were too expensive for me so they weren’t trying to win my business at this point and said I could always ditch the hosted solution later. So, I moved back to looking at hosted and have been comparing Big Commerce and Shopify without really being able to narrow a decision. BC seems to have more features but not sure it’s really cheaper and support/satisfaction seems like it might be less than Shopify. Now, someone is suggesting I reconsider Woo. Can anyone help me break this endless confusion and tie? 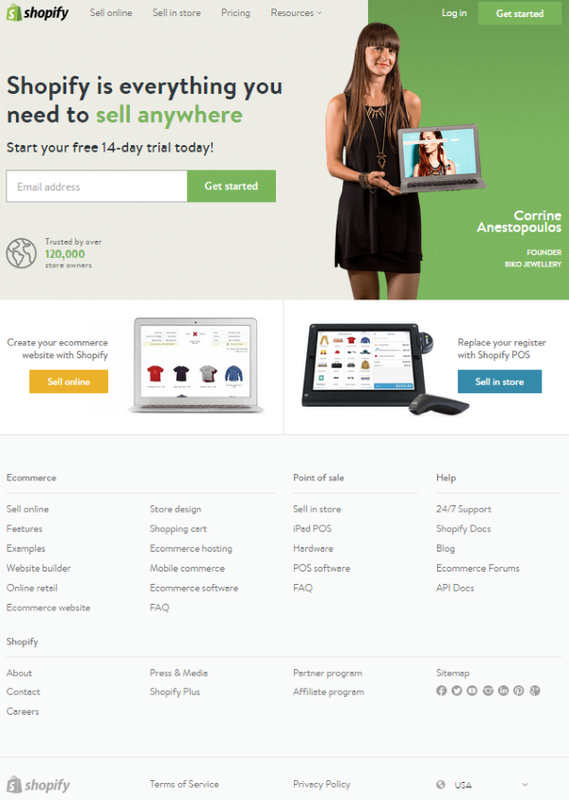 Well we have been using shopify from last 1 year and its a great platform. But the issue comes to indian customers as we have many custom requirements. there are a few cons in shopify. 1) there are way too limited options for discount coupons. 2) you cannot edit orders. 3) Very limited payment gateway options for indian users. I’ve worked in both. Started out in Shopify, liked it quite a bit (loathed the blog), but began to feel very constrained when I found I couldn’t do what I wanted design wise. Set up a blog in WP, and cross linked it with Shopify so that it was virtually seamless from user’s point of view. This worked for a while. Then I noticed Shopify’s support slipping rather badly , and set up Woo in the WordPress site. When I switched it all over to WP, my conversions soared (nearly tenfold). Now I’m 100% WordPress/Woo. I have tight security, never been breached (I run four sites), although there have been hack attempts on all of them. Good security software in place along with secure passwords will go a long way. I think the key takeaway is “if you only need a store…” Shopify is really great. It is a great platform, if you don’t mind not owning your site (and the slower suppport and longer hold times don’t bother you). But if you want MORE than just a store… A serious blog, archives, galleries, Lookbooks, whatever… WordPress/Woo is so, so much better. Steeper learning curve, yes, but if you’re smart enough to run a business you’re smart enough to handle WordPress. Your comment was very helpful. I am looking to start a online store using wordpress/woo but need some guidance. What security software would you recommend? We’ve switched from Joomla to Virtocommerce http://virtocommerce.com/ after expanding last year and now I can’t recommend it enough. I was surprised there aren’t many mentions of this platform online. What are your thoughts on it? My shop started as an AdobeGoLive shop with A PayPal button then zencart then something I forgot and now WooCommerce on WordPress. BUT I spend 5x a year what I would on Shopify on plugins! The stress of constant plug-in updating, incompatibilities and zero emergency support has me looking HARD at Shopify. I spend at least 15-20 hours a week fixing Woo related problems or trying to get a feature of a new plug-in to actually WORK. I haven’t found anyone to hire who could actually help with the WooCommerce backend issues. I am over the fantasy of WooCommerce freedom on every level. I think that the credit card processing (and other) fees are just as problematic!